When bragels first hit Canberra we headed out to brunch on them, fascinated by this cross between a bragel and a brioche. This trademarked product was the invention of Baked on Mort Street in Braddon. The place was new. The bragel was new. And the concept of this new French patisserie was new. 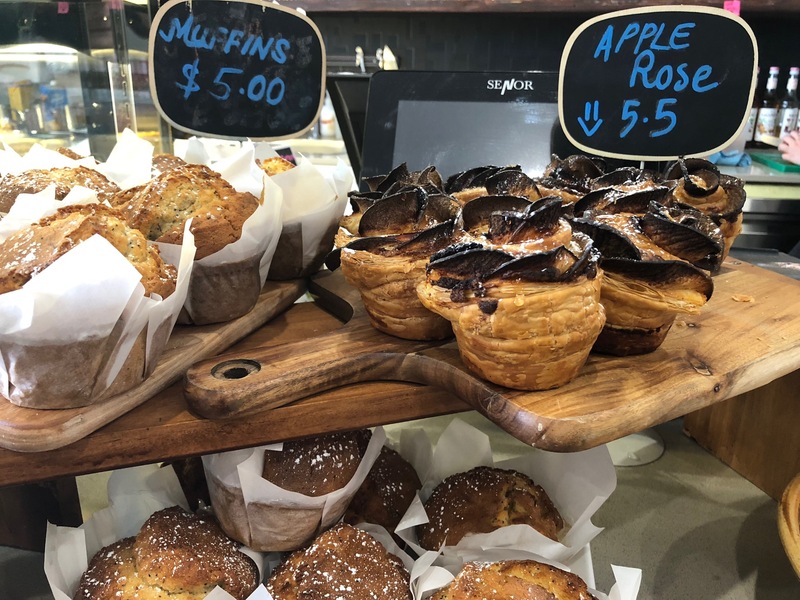 Over time Baked has matured and expanded and is now an official ‘brasserie’, fully licensed and offering up exquisite dishes that are a tasty combo of the owners’ French heritage and modern Australian living. Owners Clement Chauvin and Abel Bariller are both seasoned and award-winning operators. Abel is more or less at the helm of Baked Brasserie these days and Clement is still cooking up a storm around the corner at Les Bistronomes. 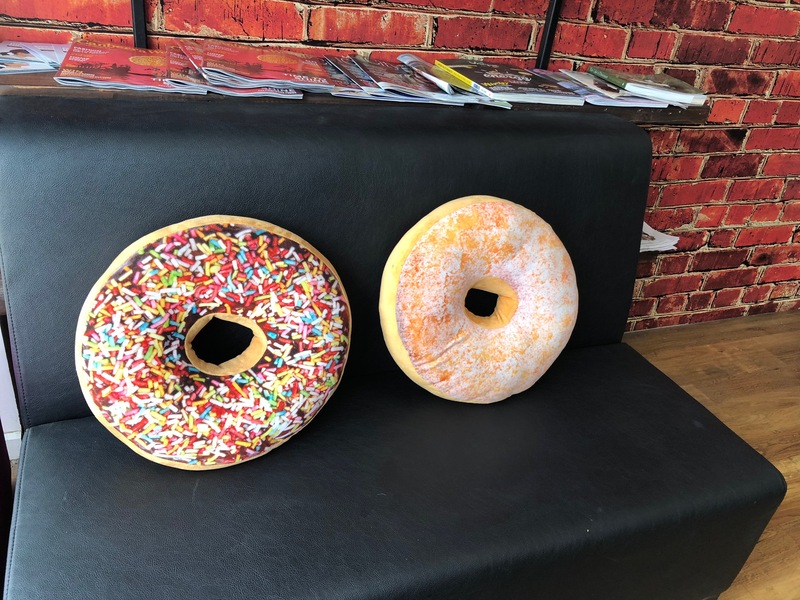 Baked’s interior has changed a fair bit since our first visit—it’s smarter looking with fun features dotted about the place, including some sweet colourful cushions shaped like donuts (OK, they aren’t exactly bragels but they’re funky). The menu has expanded and it’s a delish read from top to bottom. It was lunchtime and we couldn’t wait to dig in. The pork rillettes are just as fabulous as they are at Les Bistronomes when they’re on the menu. Repeat. ‘Just as fabulous’. This dynamite duo is famous for the amazingly creamy and decadent duck liver parfait, this one created with a sensational sour cherry compote. Super yummy. Donuts or bragels? Actually, they’re cushions. These dishes were both from the small plates menu and were sensational so we decided to keep sharing, next moving on the melt-in-the-mouth cured Atlantic salmon, served with crunchy squid ink crackers and also ponzu, soy and sesame—with none of the flavours overpowering the salmon. We could have chowed down all day on small plates but need to road test the large plates. 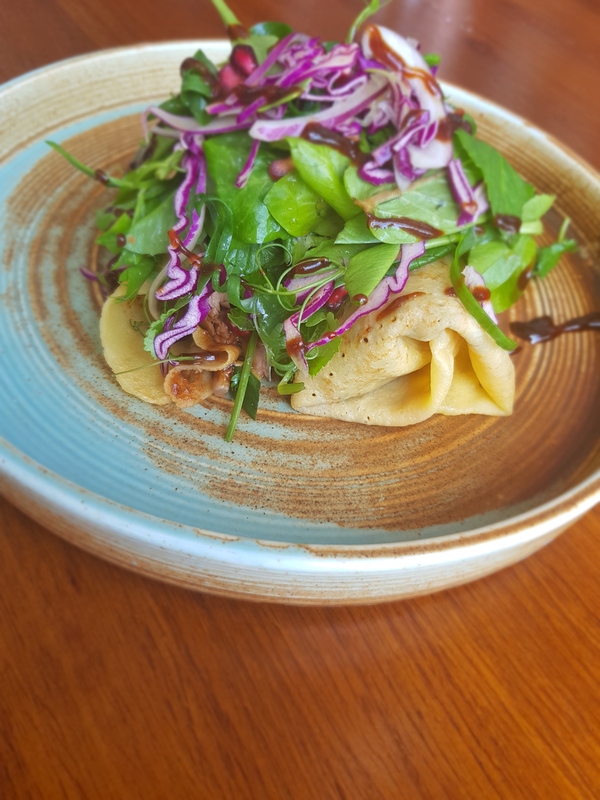 Tip: do not go past the duck French crepes with braised duck, hoisin sauce, cucumber, shallots and coriander. We wanted to leave a wee bit of room having explored the wonderful display of sweets at the front of the brasserie. We ended our Baked experience sharing a generous slice of gluten-free almond cake, which is truly a Baked specialty. And did we mention sharing a couple of gorgeous looking tarts? 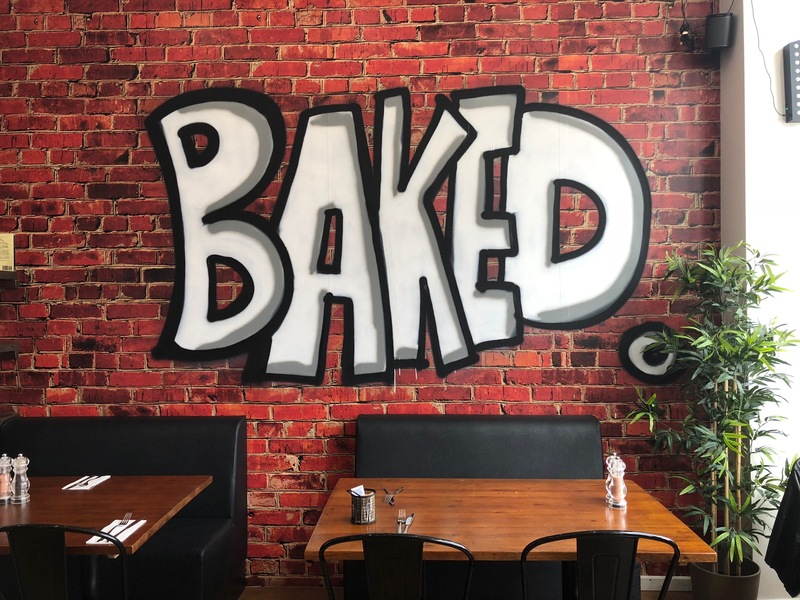 It’s fabulous that Baked is now licensed (you can also byo for $15 a bottle). Abel is a wine aficionado (actually that’s not quite true, he’s an amazing wine expert and a Knight of Cognac). The wines on the menu are quirky and super reasonably priced (we’ve spotted some in other restaurants for much more moola). A fabulous option, if you’re in the Braddon area for brekkie, is the banquet served until noon (minimum of two people). You start with coffee or tea, croissants and jam, move to granola and then scrambled eggs on toast with bacon or cheese. You can wash it all down with juice if you’d like. The concept is super for business people who want to concentrate on meeting time and not fussing over a menu. The bragels aren’t lost at Baked. Indeed, they’re as popular as ever during the day. Dinner is when they quietly disappear…but no matter because the line-up of options for evening dining is impressive. Once more, Baked offers small and large plates and you can indulge in a dinner-only degustation (minimum two people) for $65—a great deal for a seven-course chef menu. On our visit we chilled listening some cool tunes (jazz) and loved watching the world go by. We sat inside but could easily have enjoyed sitting outdoors. It’s a spacious space that enjoys the sun. 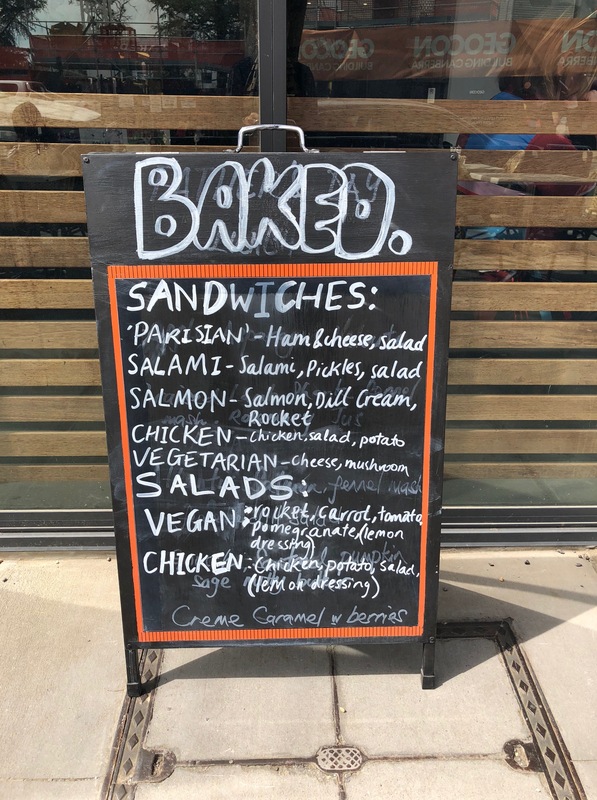 Baked is open except for Mondays. Breakfast, lunch, dinner Tuesday to Sat and breakfast and lunch Sundays. 6179 8812. 44/38 Mort Street. 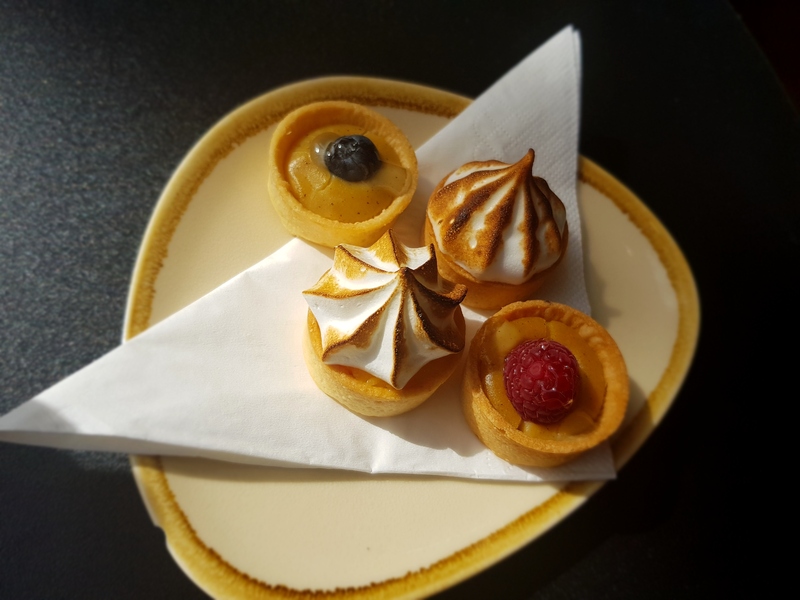 This entry was posted in LFW Food&Wine and tagged Abel Barriller, Baked, Baked Brasserie, Baked on Mort, Braddon, Bragels, Clement Chauvin, Les Bistonomes on October 24, 2018 by gracienumber1.